Submitted by Holly on 26 Sep 2013. A recent program led by Gibberagong Environmental Education Centre, part of the NSW Department of Education, saw primary school kids learning about the Powerful Owl, its habitat and the conservation of the species. The program was run in conjunction with a number of partners including Taronga Zoo, NSW National Parks and Wildlife Service, Field of Mars Environmental Education Centre, Habitat Stepping Stones, Ricoh and of course BirdLife Australia through the Powerful Owl Project. Primary students from Gordon West Public, Turramurra Public, Warrawee and West Pymble were mentored by students from Turramurra High School. The program included an overnight experience at Taronga Zoo, meeting Nangaw the Powerful Owl and expert days which included exploring Powerful Owl habitat, creating habitat features such as nest boxes and planting suitable backyard plant species. The students also got their hands on some Powerful Owl pellets to see what the owls have been eating. Following these excursions the students went away to develop some projects of their own to be shown at a Powerful Owl Expo day. The projects the kids developed were amazing and included books, mosaics, movies, posters and a human sized nest-boxes to ‘get in the mind’ of a hollow-nesting animal. The children were inspirational, showing truly amazing insights into the conservation of Powerful Owls. 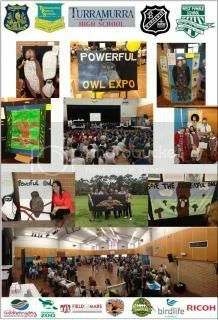 Over 300 students took part and a fantastic turnout at the expo, with a special highlight being the children performing an indigenous Powerful Owl dance. The program highlights the importance of education and the inspiration of our younger generations for the conservation of our natural world.